MAYBOLE has lost a highly regarded figure with the death of Nan Carmichael at the age of 90. 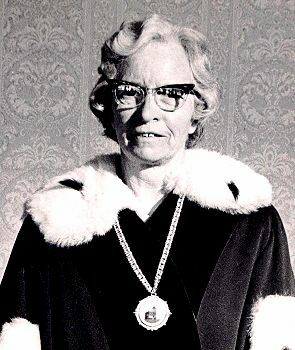 She was perhaps better known as Nan Bennett who was elected to Maybole Town Council as a Labour councillor in the 1960s, and she went on to become one of the council's Bailies and a Justice of the Peace. Along with the Provost, bailies were the traditional magistrates of a burgh, and the title goes back centuries. Just before the town council was scrapped in 1975, Nan became a founder member of Maybole Community Association recognising that there was a need to have local people involved in local affairs. She was also a founder member of Maybole Community Council when it was formed in 1977. That was the year the she was chosen as Maybole’s Citizen of the Year, a mark of the high esteem the people of the town held her in. She was also interested in the town’s history and sat on the committee that compiled a pictorial history of Maybole, which was published by the Community Council in 1982. Born Nan Fielding in October 1911, she was the eldest of a family of 5 children and became a good pianist. Her father would take Nan on the handlebars of his bike from their home in Drongan to Ayr station where she took the train to Kilmarnock for her piano lessons. Nan died peacefully on Tuesday June 28, 2002 and at her funeral on Saturday Rev Richard Martin said, "Her children remember sing-songs around the piano with Mum – and they remember her cooking, good wholesome fare but memorable. New Year’s Days Menu remains a vivid memory. Mum’s lentil soup, her steak & kidney pie (with sausage) and her trifle. Others in Maybole also enjoyed her cooking as for several years she baked cakes and fancies at The Dairy that traded on the corner of School Vennel. And that is not all Nan - was well known in the community. A lifelong member of the Labour Party, Nan served as one of the first women town councillors, a Bailie and then a JP. She was also a founder member of the Community Council. She was always championing the cause of people with needs – and if Nan was on your case you usually won!" He continued, "Nan outlived her first husband of nearly 50 years, Jim Bennett, and it was in the course of her public duties, visiting Maybole’s exchange partner town, Crosne, in France, that she met the man who was to become her second husband, John Carmichael. They were together for eight years before he died." That visit to Crosne was in 1982 for the official signing ceremony of the twinning agreement between Maybole and its French twin. Nan’s interest in town twinning went back long before that, however, as in the early 70s she attended various conferences about it on behalf of the Town Council although they did not follow it up at that time. Rev Martin added that Nan had become a member of Maybole Baptist Church by transfer on September 14th 1954. "She attended church regularly and the children came to the Sunday School, where their mother played the piano. Nan continued a member here until her death on Tuesday." ( Rev. Richard Martin - Saying Goodbye ). At the service Maybole Community Council chairman David Kiltie said: "From first knowing her in 1969 it was obvious she cared - passionately. She cared for the town, she cared for its people and she worked hard on their behalf." He continued, "We have a deep appreciation of all she has done for the town - it has been a remarkable life of service. No doubt there would have been sacrifices in her family life and we offer our appreciation to her family, too. She was a special person and you all have our sympathies and condolences."